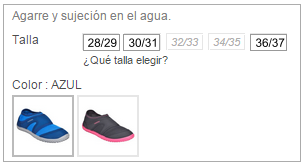 In a table in a web app, multiple objects of the same type are aggregated. Every object has a condition which is a number between one and five. At first, I thought about using a progress bar-like style where the range would be colored. However, this probably isn't clear to the user when the range includes the one since the user will probably mistake the range for a single value (the highest). For example, we have a table that stores used shirts. Every shirt has a condition assigned to it. 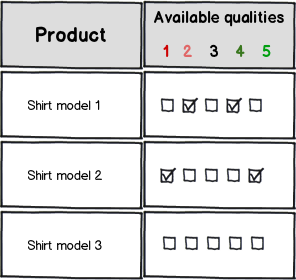 Now we could group these shirts by size and I am trying to indicate that shirts with conditions ranging from medium (3) to high (5) quality are available. Have a look at the image: Not knowing the interpretation beforehand, one is bound to believe the image shows the value four, not the range from one to four. What could I do to prevent this? If you stick to graphic control to set the range, displaying numbers inside the segments will help you. They are convey the idea of the set, rather than single value. Of cousre, test this UI. According to your edit, I doubt using the range is the best mean. Range is mostly understood as the elements within lower and upper limits, or interval. Ranges are good for continuous values, e.g. goods with prices in the range of $100-$200. In your case you have the set of descrete values, some of them could be in your subset. Do think about whether showing the range is a useful addition. I've never seen a range of ratings displayed like that, so make sure your specific case justifies it. If you're absolutely sure, try following common patterns for displaying ranges. 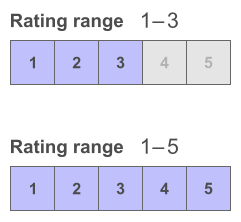 In addition, I would add a little margin on either side of the 1 and 5 so that the sliders never reach the endpoints, therefore cannot be mistaken for a single value. For bonus points, the average rating is displayed on top, along with the word "average". Although you didn't specify this as a requirement, I think it further helps to remove the ambiguity of range vs. value. This idea is close to the one at the end of the answer from Alexey Kolchenko. Not the answer you're looking for? Browse other questions tagged intuition range or ask your own question. What is the best web UI for choosing a range on a form? Drop down menu or range slider for salary range filter? Best design for time range filter?